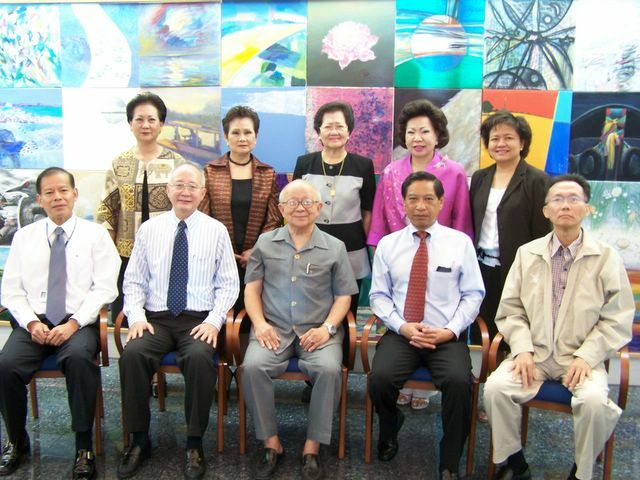 TISCO Foundation Board of Directors Meeting on April 28, 2005. Seated: Pliu Mangkornkanok, Dr. Suvarn Valaisathien, Kamchorn Sathirakul (Chairman), Sivaporn Dardarananda (Vice-Chairman), Suthep Kunajak. Standing: Pattira Wattanavarangkul (Manager), Srisooda Boonlong, Uvares Klewpatinond, Vannee Uboldejpracharak, and Duangrat Kittivittayakul. The Foundation Board approved a budget of Baht 7,000,000 in scholarships for approximately 4000 students for 2005 .